Lost interest? It's so bad I've lost apathy. 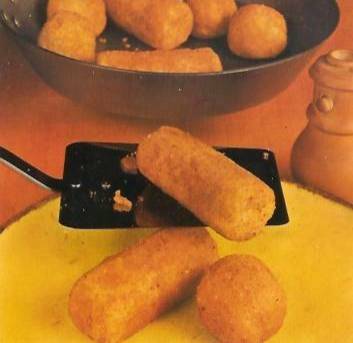 You can freeze the croquettes - just take them out of the fryer a minute before they are done and freeze. Make sure you thoroughly thaw the croquettes - then put them in the fryer for a minute or so until they are golden brown. Please make sure they are thoroughly thawed as they will turn otherwise into little bombs that splash scalding fat on you! Cut one open with a knife to check. Please. Now half of the eggs as egg yolk (e.g. you are making this for four, use one egg here, using only the egg yolk) and keep mashing ... the mixture will turn sticky now, so slowly add the flour (again, you might not need all for the flour, depending on the type of potatoes) until the mixture is again firm and only slightly sticky. Take the pre-formed croquettes out of the fridge. Open the other half of your eggs (e.g. one if you are making this for four) up and put the contents on a plate. Mix thoroughly with a fork. Take another plate and put breadcrumbs on it. Pre-heat your deep fat fryer to 180 degrees centigrade (350 Fahrenheit). When the fat has reached its temperature, take each individual croquette, turn it in the whisked egg so it is completely coated in egg and then in the breadcrumbs (again, coating it completely in a thin layer of breadcrumbs). 7 Great Thanks. Can they be done in an oven? 10 I was looking for a quick recipe to use with my leftover mash potatoes, and this recipe is great well explained and so easy. The Croquettes are so Yummy! thank you! 6 Hi Kim...u should not get a too wet or stkicy paste. As I stated I wear a plastic glove to do the moulding so I do not find it stkicy :P I just use my finger to pat some flour all over the cakes, no need alot, just to ensure the eggs can stick to the patties :). After chilling immediately pan fry no need bring to room temp. Lastly, yes, u can freeze them after coating with breadcrumbs. 10 I coat them with a mix of grated cheese and homemade bread crumbs,, then freeze them. When needed deep fry in light olive oil - delicious or deep fry first then freeze then oven bake - top marks! 8 Lovely .. I added some Grated Onion ..
7 your dishes are not that healthy, as u deep fry potato croquettes. u just fry it in oil. pls improve, otherwise nice instructions and clear amout of ingredients! keep up that gd work. im a 11 year kid. sry if i said anything wrongly. thank you and bye! 10 amazing!! i would totaly have them again!!!! 9 i really do hope this recipe works as i tried making them last night as a tester for tonights dinner, they were unsuccessful to say the least. anyway, this looks rather promising. 10 Add some seasoning to the breadcrumbs mixture for extra yumminess. 3 Just about edible !